Acorn squash is perfect for simply cooking as done in this recipe or fill with various ingredients for an elegant presentation, not to mention a sweeter or savory version. Try different spices, add raisins, nuts and apples or fill with rice or pasta. Use your imagination to make it uniquely yours! 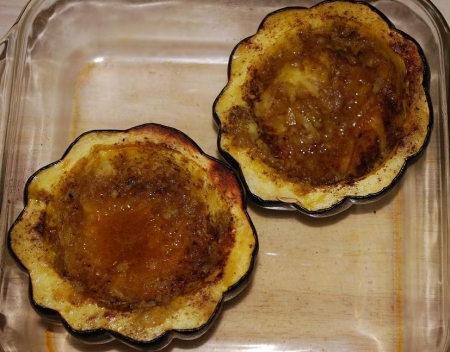 Acorn squash pairs nicely with pork or add cooked sausage to the filling for a complete meal. Serves 2. Cut top and bottom of squash to create a stable base, cut in half and remove seeds. Be careful when cutting the squash because they are very dense. Place squash pulp side up in a baking dish or pan and add remaining ingredients dividing evenly between each squash. Try to sprinkle the spices on the sides as well as the bottom. Add enough water that a quarter of the squash is covered. Cover with foil and bake at 375 degrees for about 1 hour or until tender. Let cool, slightly. Be careful when removing foil, the steam is hot. Gently remove squash and serve.